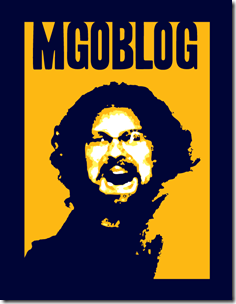 MGoBlog's Michigan football preview magazine goes indie. 1,774 backers pledged $54,486 to help bring this project to life. In 2008, Maple Street Press started a series of annuals with a unique twist: each one would be edited by one of the foremost members of that team's blogosphere. Hail To The Victors was the second one off the ground and one of the most successful. Unfortunately, MSP went under this year. 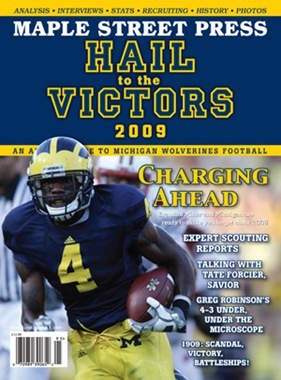 In our four-year run we published technical explanations of zone running and the ill-fated 3-3-5, demonstrations that the gap between Michigan's recruiting and its results was largely a matter of terrible retention, evidence that Lloyd Carr really did turn his offense off at times, lyrical tributes to Brandon Graham and Demar Dorsey, a peek inside a Michigan quarterbacks meeting, extensive previews of both opponent and team, examinations of teams from 1909, 1981, and a lot of years in-between, and a ton of other stuff. It would be a shame to cede the field to cookie-cutter national publications. Fortunately for us, this year we managed to get all the pieces together -- fulfillment, distribution, photos, design, publicity -- to take it independent. Now we just need about half of the fairly withering upfront costs required to publish a bunch of full-color glossy magazines. By doing this we assure ourselves that we're not going to end up looking at our wives, saying "I can explain!" The one, the only, the exclusive Brian photobomb T-shirt. This is a terrible idea. This is how much I want the mag to happen. As is well known, children's birthday parties don't go for less than five digits. Please no one actually buy this. One (one) copy of the finished mag shipped to you. W/ shipping this is a discount from our projected final price. International customers please add $5 for extra shipping costs. Brian-signed copy of the finished mag. Personalized(!) signed mag. I will tell your one uncle--you know which one--that you're my hero. Or whatever else you like. BONUS: your name goes on the sponsors' page in the mag. And you get the t-shirt too. Personalized signed mag, photobomb T, and you get two sentences on the sponsor page to thrill and amaze your friends. Everything below and Brian shows up at your child's birthday party in a Terrelle Pryor jersey with a surly entourage in tow.